The idea that there are melee factions is an old fashioned one in Warmachine. Certainly with the newest wave of releases, it is rare that a faction cannot simulate a style of gameplay, or include a few ranged pieces etc. That said, the factions that were originally conceived as the bruiser factions still have that legacy. They tend to run melee powerhouse armies incredibly well, in ways that Cygnar, for example, doesn’t. Trollbloods are such an army. No faction can take it on the chin, from caster to solo, like the Trollbloods. Just killing Jannisa is one of the most onerous experiences in the world. Those ‘melee faction’s often hate facing Cryx more than anyone else. You aren’t bringing a knife to a gunfight like you are against Caine, you are trying to face the infinite horrors of the void with a spoon. The clouds are hellish for melee infantry, moreover your beloved nihilators/fennblades have to come forward to do anything, and then it’s bile o’clock. Taking heavy infantry or beasts only makes the banes all the grinnier. 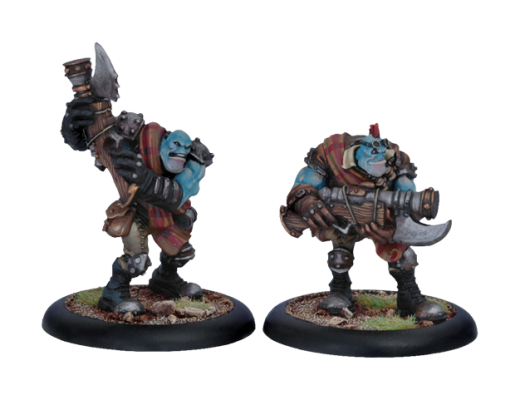 That said, Trollbloods have some really solid options. I think it’s a very varied faction with lots of funky tricks, and surprisingly great ranged game. Caster independent models are a vital part of a faction’s options against the Lich. I think the first vital question you need to ask yourself in the Trollblood faction is: how far forward am I playing my ‘lock? The answer is often very. The next question is: can Lich’s feat kill me? The answer is usually no, if your careful. This is one of the incredible strengths of the faction. Pressure by assassination is rarely viable against Trollbloods. Your best friends in this regard are Janissa, the krielstone, and sometimes just gobbers to block LoS. If you are packed in behind the wall with a few of your enormous, medium-based support models it’s very hard to get a large number of bane attacks onto you. And it requires several to kill a Trollblood warlock. Oh, how I hate when you make Tough checks. So your caster is safe? Big surprise! What about the rest of your army? Unless you have a game plan multi-wound models are usually not the best plan against Cryx, despite their resistance to bile thralls. Some of the ‘locks however make them hum in new and interesting ways. One of the best ways to excarnate-proof your troops is the Gatorman Witch Doctor, but he is 3 points to just add undead. It’s not bad, for example, burrowers love being fearless, but it’s expensive. The Tough mechanic can be surprisingly effective at stopping some excarnates dead, but you have to, as always, kill the blood hag early and with prejudice. So how do we clear waves of troops? Some of whom may be incorporeal? Scattergunners are the first unit that come to mind. Those guys can chew up zone sized sections of the board. They ignoring Stealth and often hit 2-3 models per shot, thus having enough spare attacks to mop up Tough units. That unit is so good that it often kills models in games it’s not being used in… when I forget that sprays do affect my guys! I actually really like Runeshapers. They have an awesome magic attack, and at arm 17 with 5 boxes are purge immune but not as expensive or valuable as champions. And seriously, magic 7 rockhammer! I love rockhammer! Especially if, while casting it, you pronounce it like the rocket launcher weapon pickup in Metal Slug! It would be remiss of me not to say that I think the new sorcerer model is an awesome inclusion to any list planning to face Cryx. Deneghra is still a thing. Most of Trollblood tools against the Lich are caster based, which is a big indication of how different they feel about the matchup compared to Menoth or Cygnar. Unlike Skorne though, I feel like they have a few casters that offer some really, really excellent anti-Cryx options. I played Trolls, briefly, in Mark 1 and I haven’t since. This is because my local area is chock full of very good Troll players who really utilise the whole faction. This and the fact that there doesn’t seem to be many Troll players on the global convention scene means that other than Gunnbjorn, I’m not sure what to classify as a Dark Horse. I’m going to go with the guys I think have a subtle game against the Lich. 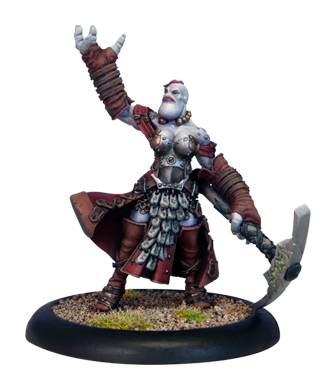 It would be difficult of me to have such a conversation without discussing Grissel1, who is ‘probably the best Trollblood warlock.’ As a long time fan of Grissel, I’m really glad that people are playing her. Her power in this matchup comes from mixing the storm troll’s animus with heroic ballad. This lets longriders kill 4-5 troops in any given activation, between impact attacks and electro leaps. That’s the kind of troop clearing I’m taking about when I want to roll Lich back up. The set of lists inspired by Chad of MoM fame are floating around the internet at the moment, and Stu has started to dabble in a little in his new article, It’s In The Blood. After you have included your storm troll, it’s all a game of Keep Calm and Cacophony On. Taking Hoof It literally since 1984! Calandra is another ‘lock with an interesting trick against Cryx. She often likes to take Nyss, so I feel that Witch doctor becomes very good here. Starcrossed can be hellish for a not particularly accurate melee oriented faction like Cryx. And the Lich has no accuracy buffs. You have to kill Tartarus early and with prejudice, don’t be afraid to run your stone up a bit to remove stealth and impaler/bomber him. He’s the main obstacle to starcrossed slowing your enemy down. Then the nyss need to kill the bile thralls with extreme prejudice. It’s a dicey game you’re playing, and I’m not sure it’s that solid. Grim2 is the new kid on the block and I think he has traction just because mortality and mark the target scatter gunners kill solid blocks of infantry with alarming speed. I don’t think you want to bring a Madrak or Borka, even though they are certainly Spectral Legion resistant. Let’s talk about Doomshaper1, and Runes of War. It’s the best theme force that’s almost never seen. Runeshaper units that cost 3 points are more than 10 euro a model! The important part of the sentence however, was runeshaper units that cost 3 points! At that efficiency I think they are awesome against Cryx, and again, quite hard to excarnate or purge because they are effectively Arm 22. Just think of the damage as ablative armor. Back in my day, even Mulg was was one point less! In researching this topic, an incredibly helpful gentleman with the forum handle of ‘zor’ provided a write up of playing Runes of War against Lich2. It says everything I wouldn’t be able to, and so I am compelled to link you to it directly. Do give him kudos! Last but not least, Grim Angus. The scowling beef is a warlock that I feel was specifically designed as a Cryx matchup fixer for a faction that struggle with them. He has a true sight and a magical gun that can, and will, be Rng 17”. This makes him able to trivially kill a solo a turn, and he can ignore cover while doing so if he needs to. He should be killing the blood hag, or forcing her to stay well back and behind a cloud wall every game. He’s dictating the Lich’s focus just by being on the board. Then there is marked for death, so that that pesky incorporeal or Stealth isn’t a problem anymore. This means scattergunners really can kill an entire Cryx army. His feat is amazing against Cryx. -3 Def, -3 Spd, and no special attacks means no purging. That and you can go pretty far up with it, because for that turn, the Spectral Legion cannot get to Grim. This gives you two turns to shoot a load of Def debuffed infantry off the board, which is exactly the kind of attrition power required against Lich2. Do be wary that I feel like after the feat Grim is in a lot of danger, and Lich will often bounce back very hard against him if you haven’t been especially careful or efficient. As with the Harbinger, don’t feat the turn before engagement, feat after, and then move the scatter gunners up hard and fast. The above is a bit of a compromise between being a second list, and focusing on killing as many guys as fast as possible. I’m more than open to suggestions on tweaks to it! I’m also running very long. Next week, we get straight to the point with the Retribution of Scyrah.